Energy Outlook: Is North America the New Middle East for Oil? Is North America the New Middle East for Oil? With the President of the United States currently playing the role of pessimist-in-chief with regard to US energy independence, it's refreshing to see that goal raised as a serious possibility by someone whose experience and position give him deeper insights on the subject. A few years ago Ed Morse was running the oil trading operation for Hess, and now he's at Citigroup. His op-ed in today's Wall St. Journal offers an upbeat analysis of the ongoing resurgence in US and Canadian production and the potential for North America to move within striking distance of true oil independence. He doesn't appear to be predicting $2.50 per gallon gasoline any time soon, but he does remind us that permanently higher oil prices needn't be inevitable, although he is also very clear about the obstacles that could impede these developments. How often have politicians and pundits reminded us that we can't drill our way to energy independence? I've said that myself numerous times in the eight years I've been blogging here. So before exploring the implications of producing significantly more oil than we do today, it's worth asking why some experts are starting to question what has been a bedrock assumption about the US energy situation since our conventional oil production peaked in 1970--not coincidentally just before the first oil crisis in 1973-74. If the tired talking point about the US having just 2% of the world's oil reserves were truly reflective of reality, rather than a technicality based on the way the SEC requires oil companies to account for their chief assets, people like Ed Morse wouldn't give energy independence a moment's thought. The number to focus on is not the 21 billion barrels of proved reserves on companies' books, but the nearly 200 billion barrels of discovered and undiscovered "technically recoverable oil resources" onshore and offshore, in the lower-48 and Alaska. That figure represents more than 95 years of production at current rates. That estimate is also mostly based on assessments from the 1980s done with technology that bears the same relationship to current exploration techniques as an old Ma Bell rotary phone does to an iPhone. It's technology that is shifting expectations about what is actually possible. Consider the Bakken shale formation in the Dakotas. The conventional Williston Basin oil fields were discovered in the early 1950s and mostly played out by the late 1980s. The billions of barrels of resources in the adjacent Bakken shale, which might produce a million barrels per day by the end of this decade, simply couldn't have been produced at commercially useful rates with the technology that was available until the last decade. The hot question now is where the next Bakkens will be found. Then there's deepwater drilling, which suffered a big setback with the Deepwater Horizon accident and spill but is still contributing 1.2 million barrels per day and could reach 1.9 million next year. What moves Mr. Morse's speculation from wishfulness into the realm of practical possibility is the potential of applying technologies like those to exploit conventional and unconventional reservoirs to which industry has not had access since their development, if ever. Nor is OPEC monolithic; it's made up of a group of producers with very different levels of reserves and production, and differing domestic requirements for the revenue they earn from selling their oil. That means that, contrary to yet another talking point, OPEC does not have unlimited capacity to back down production, in order to keep prices high when others increase output. And even when it can maintain enough cohesion to tighten quotas and restrict its own output, the production in question merely shifts to "spare capacity", the expansion of which reduces oil market volatility. Imagine how different the market's response to the current confrontation over Iran's nuclear program might look if other producers had a multiple of Iran's exports in reserve. Just because something is possible with a decade or so of determined effort doesn't make it inevitable. While I share Mr. Morse's optimism about the benefits of boosting North American oil production on a scale that would dwarf the modest recent upturn, which has received so much attention from politicians who had nothing to do with it, I'm also skeptical that it could proceed to quite that extent in today's climate. Aside from people who are genuinely concerned about the possible environmental impact of more oil development, there are also those who would regard such a turn of events as contrary to their own interests and their perception of the nation's. How would we convince consumers to pay the premium for new cars achieving an average of 54.5 mpg in 2025 if gasoline remained between $3 and $4 per gallon, instead of trending toward $6--let alone shifting them into electric vehicles that the government and carmakers have invested billions in developing? And how would we stimulate production of advanced biofuels if the future price of crude oil were seen as being capped at or below $100 per barrel, except during geopolitical crises? I believe all such questions have answers that don't depend on us constraining access to our resources at the cost of remaining more vulnerable to overseas suppliers and weakening both our trade deficit and our currency. I'd rather have the extra domestic oil and then worry about how to spend some of the resulting windfall of federal and state taxes, bid bonuses and royalties on achieving our other policy objectives, such as promoting efficiency and reducing emissions. 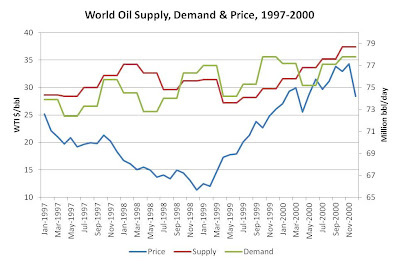 Nor is relying on OPEC to keep prices high the best or most effective way to encourage us to use oil more frugally. I don't know if North America is the next Middle East, although it's worth recalling that we were the world's biggest oil supplier before the first well was drilled in Saudi Arabia, and DOE estimates suggest we have as much oil left as we've produced to date since 1859. However, I do know that I would much rather give OPEC's leaders sleepless nights worrying how they'll keep oil prices high in the face of a wave of new production from the US, Canada and possibly Mexico, in preference to giving US consumers sleepless nights about how they'll pay for the gasoline they need for their commutes and the fuel to heat their homes, if prices stay this high or higher from here on out. Good write up, thanks. There's a lot of controversy about the issue of energy independence, and a lot of misinformation, unfortunately. I think you covered a lot of that well. Be interesting to see what happens. The Beginning of the End for Coal? A Cleantech Trade War with China? What Would It Take for Gas to Hit $5 per Gallon?